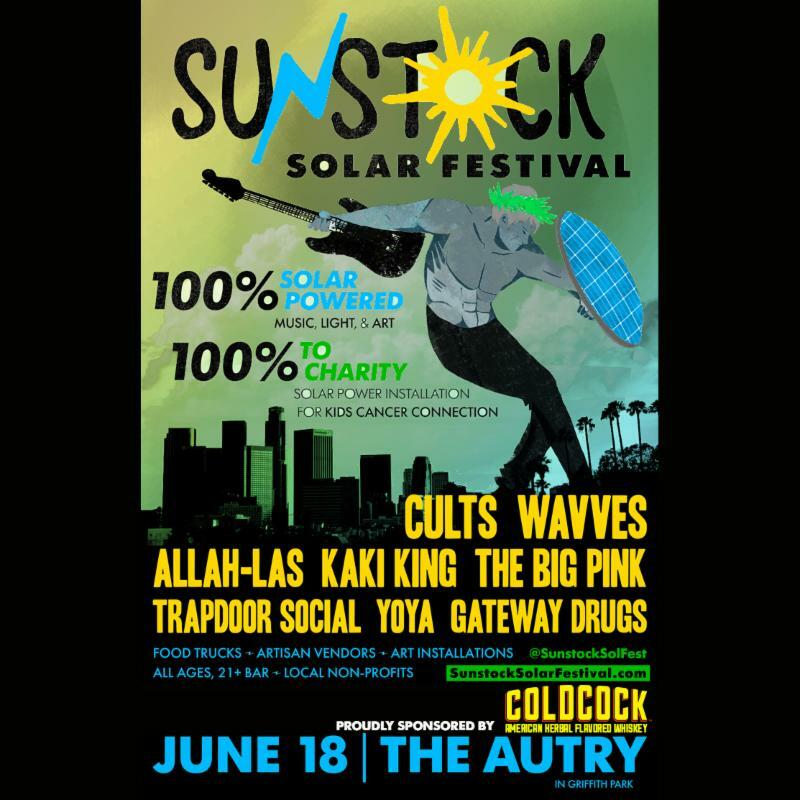 COLDCOCK Whiskey is proud to sponsor Sunstock Solar Festival, a 100% solar powered music festival taking place on June 18. Tickets are now available through Eventbrite for $20 and $25 at the door. The festival will be located in a secluded corner of Griffith Park at the Autry Museum of the American West, 4700 Western Heritage Way, Los Angeles, CA. A bike valet and plenty of free parking will be available in the Los Angeles Zoo parking lot. The event will feature live performances from Cults, Wavves, Allah-Las, Trapdoor Social and more, and include food trucks, artisan vendors, art installations and beyond. Doors open at 4 p.m. and music goes live at 5 p.m.
100% of the event proceeds will help fund a solar roof installed by Sunstock partner, GRID Alternatives, for Kids Cancer Connection, a local charity. 21+ Fans can stop by the COLDCOCK Whiskey booth for special artist meet and greets and take their shot of COLDCOCK. "COLDCOCK Whiskey is proud to take part in such a unique event donating to a great cause. We're excited to support awareness about alternative energy sources and eco-friendly practices with our friends at Sunstock Solar Festival,"Rick Zeiler, CEO of COLDCOCK Whiskey said. Visit sunstocksolarfestival.com for updated information on the line-up and amenities. For more information on COLDCOCK Whiskey, please visit coldcockwhiskey.comor follow @coldcockwhiskey. COLDCOCK American Herbal Flavored Whiskey is the world's first and only herbal whiskey. Established in 2012 and based in San Diego, California, Zeiler Spirits LLC is the producer of COLDCOCK American Herbal Flavored Whiskey. The spirits supplier was founded by liquor and entertainment industry veterans, musicians and action sports athletes who have collectively created some of the world's most exciting lifestyle events and cross promotions. COLDCOCK American Herbal Flavored Whiskey is 100% aged American bourbon blended with a variety of herbs, including green tea, hibiscus, ginger, eucalyptus, cinnamon and gingko. Currently available in 25 states and parts of Canada. COLDCOCK American Herbal Flavored Whiskey is 70 proof and sold in 750ml and 50ml bottles.